TinyGPS, by Mikal Hart, converts NEMA format global positioning data into easy-to-use variables for Latitude, Longitude, Time and other information. TinyGPS only converts data. You must use UART Serial or NewSoftSerial or some other way to obtain the NEMA format data to feed into TinyGPS. Even though TinyGPS doesn't require any hardware, in practice, you will need a GPS module for the data source. In this photo, a PMB-648 GPS module from Parallax was used. Since these GPS modules can run from either 5 or 3.3 volt power, and they feature TTL level serial signals that can connect directly to the Teensy's RX and TX pins, connecting them to Teensy is very easy. For use with Teensy 3.0, most GPS modules output a 3.3 volt "TTL level" signal, even when powered from 5 volts. TTL level output is actually 2.8 volts, even with 5V power. Create the TinyGPS object, giving it a name of your choice. While you could create multiple TinyGPS objects, it's unlikely you would need to decode more than one NEMA format data stream. Each byte of NEMA data must be giving to TinyGPS by using encode(). True is returned when new data has been fully decoded and can be used. Get the position, where latitude and longitude are variables of long type, and the values are multiplied by 10,000. The age variable must be unsigned long type. Get the position, where latitude and longitude are variables of float type, and the actual values are returned. Float types are easier to use, but result in larger and slower code. The age variable must be unsigned long type. Many other variables can be obtained. Please refer to the official TinyGPS page for complete documentation, or the example code to see how these are used. This example is a slightly modified version of the test program that comes in the examples directory with TinyGPS. It uses Teensy's real serial port (UART) instead of NewSoftSerial. Teensy also can transmit data rapidly on USB, so extra checking for input data that would be needed on Arduino's slow Serial object has been removed. // break;  // uncomment to print new data immediately! NEMA format GPS data is usually transmitted at 4800 baud, in 8N1 format. The resulting maximum incoming speed is 480 bytes per second. 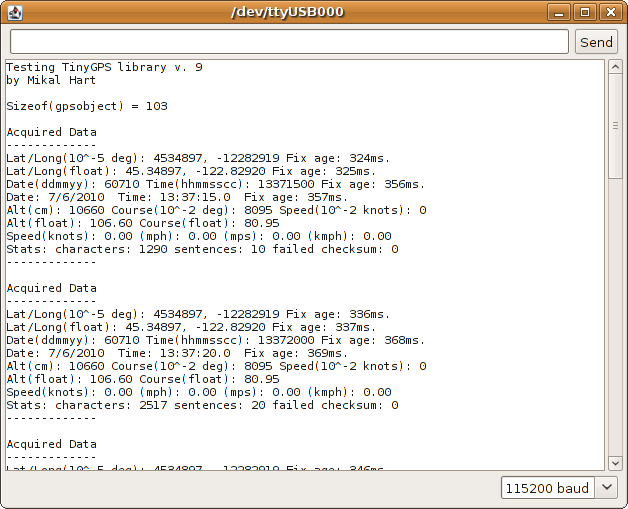 By default, Teensyduino's UART Serial buffers up to 64 bytes, or 0.133 seconds of incoming data. If your program must perform some operation for more than 0.13 seconds, it should check for new data and give it to TinyGPS with gps.encode() within that time period. The buffer may be increased to as much as 255 bytes. The official TinyGPS page by Mikal Hart has very detailed information about using TinyGPS.